each of your positions is both an art and a science. Avery Partners Healthcare provides business solutions to our clients through talent acquisition & team development. We partner with you , guiding you through defining, aligning, and selecting either new talent, temporary talent, or existing talent in roles that not only meet your organizational goals, but engages each person in the overall mission. Using the industry’s best practices and technologies, Avery scours the market place to find candidates who are pre-screened and interested in working for you. Each candidate we present has already undergone a comprehensive screening & credentialing process. 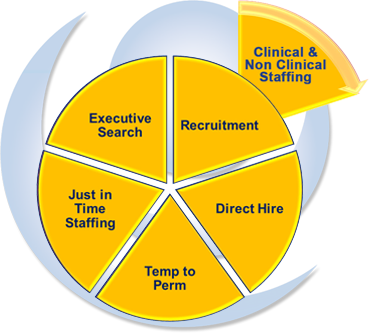 Our standard process includes employment history verification, criminal background check and validation of all clinical staff licenses. We can customize this process to meet specific client requirements. Avery Partners is available at almost a moment’s notice to meet all your short term or emergency staffing needs. Count on Avery to have the help you need, when you need it! We partner with you to understand the position, unique culture, and critical skills required for the position you are seeking to fill on a long-term basis. Our commitment to understanding your needs allows us to deliver only the most qualified candidate to your door and to get it right the first time. Temp to perm provides you with an alternative way to hire a permanent employee. This provides an opportunity for you to observe skills on the job and determine how this person interacts with staff and patients before making a permanent placement. By doing this you get the best of both worlds.